Most APIs have only one response format, either JSON or XML. But what should we do in the case of an API endpoint that can return either JSON OR XML? We could write two different tests, with one supporting each response type, but we’d be repeating a good amount of code in both tests. API Fortress allows you to test both, using the same I/O component and assertion components for almost all test cases. In a few cases, we’ll need to add a bit of extra logic to allow the platform to distinguish between the two formats. API Fortress allows you to solve this issue by making only one call. 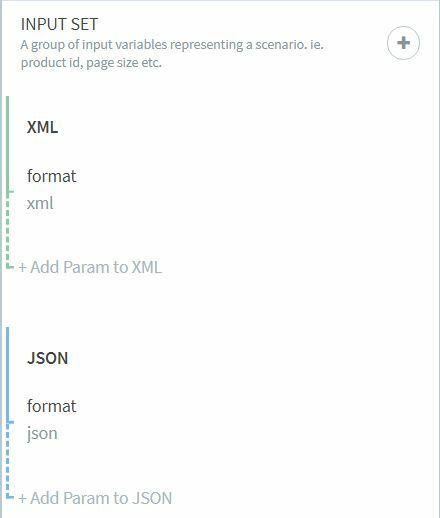 Let’s start adding the different formats as variables, as seen below. Now, we can remove one call and add the format variable in the “Mode” input. The header is still static at this point. We need to turn it into a dynamic one which changes to suit the data type of the API we are testing. We add a variable component above the I/O operation that will return the appropriate value. Now, the test will be executed two times; once for ‘XML’ and once for ‘JSON’, ensuring that the header will have the correct value.